The problem with anthologies is that they tend to be produced without too much thought, not infrequently being nothing more than a collection of writings thrown together with very little editing at all. In those circumstances however good the material that has been gathered there is always a sense of disappointment in the final product. Brearley on Cricket is undoubtedly an anthology, but that criticism cannot be levelled at it. To begin with there are a few essays in Brearley on Cricket that are new and have not been published elsewhere. Where the pieces have appeared before they have been reviewed and in some cases reworked. That said Brearley has always, in the commentary that introduces each of the 49 chapters that represent the individual items he has selected, put them in context and explained why, if he presents a ‘second edition’, his earlier writing has been revisited. One of the first cricket books I bought was the second edition of Douglas Jardine’s account of the 1932/33 Bodyline Tour, In Quest Of The Ashes. The book was published by Orbis to coincide with the surge in interest in the series that its fiftieth anniversary brought. It contained a new introduction by John Arlott, interesting enough but no more than that. Later I became a collector so felt I had to acquire a copy of the first edition, and in time duly did. Later, in 2005, a third edition appeared. This had a memoir of him from one of Jardine’s four daughters, and I still recall standing in Waterstones for half an hour one lunchtime reading what she had to say about her father. I couldn’t however justify to myself the purchase of a third copy of the same book, so have never looked at it again. In my eagerness to read Fianach Lawrie’s story I completely overlooked the fact that a lengthy introduction to that third edition had been contributed by Brearley, like Jardine a much vaunted England skipper. That introduction, reproduced here in full, is certainly the highlight of the collection of pieces in Brearley On Cricket as far as this reviewer is concerned. Jardine’s book is a fascinating one, and his legal training shines through in the way in which he analyses those aspects of the famous tour that he considers worthy of explanation. Well argued as it is in places In Quest of the Ashes is more than a little disingenuous at times, and Brearley’s analysis of the Iron Duke and his thinking is spot on. A man with an intellect such as Brearley’s was always going to be able to spot the flaws in Jardine’s argument, and he clearly disapproves of the tactics he adopted. At the same time however Brearley also recognises Jardine’s strength of character and the problems he faced, and the end result is a balanced and interesting analysis of a book that is unusual in that its importance lies as much in what it does not say as in what it does say. The only frustration in the piece is that in the intervening years the error that saw batsman Australian batsman Victor Richardson referred to as Arthur, an off spinning all rounder of the 1920s, has not been corrected. Brearley looks at other behavioural issues as well, and the issues raised by ‘sandpapergate’ are the subject of a new piece of writing. Measured as always Brearley’s views are illuminating and, as with the opinions he expresses elsewhere on Mohammed Amir, very difficult to disagree with. Also present is an important essay on John Arlott, which is an affectionate memoir of a man who Brearley clearly cared about, but it does not shy away from dealing with the sad decline in his old friend as Anno Domini caught up with him. Rather different but no less compelling is a piece about another old friend, Doug Insole and what has come to be known as the D’Oliveira Affair. Just as I had come to the view that perhaps there was no ‘interference’ in the selectors choices for the tour party that was due to visit South Africa in 1968/69 thanks to Brearley I am caused to wonder again. Now that Insole has departed this mortal coil (he was the last survivor from the fateful committee meeting when the party was chosen) we will learn nothing new. That said one or two observations from Brearley based on conversation with Insole in the past, if not quite breaking new ground, do illuminate what has been revealed over the years and, as with every subject Brearley tackles his explanation is a thorough one. Those who hoped there might be something of the autobiography in Brearley on Cricket may be a little disappointed, but there is a good deal of Brearley’s own life and career here, and much of his values and the way he thinks. In terms of his own life we should know more about that next year when a biography is due to appear from the pen of Mark Peel. 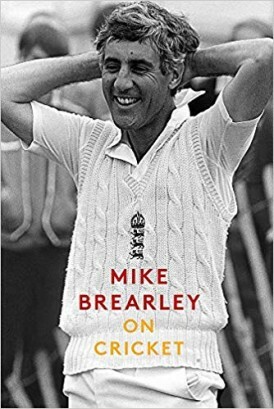 Brearley has not had any direct involvement in that project, but has not sought to put any barriers in Peel’s way so, given that one suspects Brearley has no intention of producing a full blown autobiography this splendid collection will give an opportunity to read more about a man who, whatever his limitations as a batsmen were, remains one of England’s finest captains, and certainly its most articulate. Brearley on Cricket is highly recommended.